250 years ago Cook was at Tahiti with Endeavour on his First Pacific Voyage. Visit our web pages about the people who went with him then and the commemorations taking place now, and planned in 2019 and 2020. The Captain Cook Society has an international membership from countries such as Australia, Canada, Japan, New Zealand, Sweden, United Kingdom and the United States. In all, we have about 500 members and they receive a free quarterly publication called Cook's Log. Each issue contains articles on many aspects of James Cook's Life and those associated with him. Membership is open to anyone interested in Captain James Cook, whether professionally or as a hobby. Your interests might be in animals, astronomy, birds, books, botany, coins, discovery, engravings, ethnography, exploration, family history, journals, magazines, medals, navigation, ships, stamps, wills, or zoology. You'll find that Cook's Log covers all these subjects and more! The answers to many Frequently Asked Questions (FAQs) can be found by clicking here. 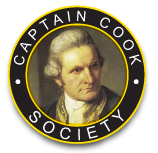 The Society was formed in 1975 as the Captain Cook Study Unit and changed its name to the Captain Cook Society in 2001. The first officers lived in the USA and Australia. Currently, one officer lives in New Zealand, and the other three live in the UK. There is also an Australian branch with additional officers and an additional journal called Endeavour Lines. Members in Canada, Germany and New Zealand also hold meetings from time to time. Click here to read news about our future and past meetings, including Australia, Canada, Germany, New Zealand and UK. Discover beautiful engravings from Cook's voyages . More These are perhaps the most notable dates in James Cook's life. More Here you can find related places and sights to Captain James Cook. Such as Cooks' Cottage and many more. Who was the crew and what did they do? More Read about the ships that Cook sailed in.